It’s January; the calendar has a new year, and my birthdate is printed on the front page. At this time of the year, when the weather can be dangerously cold, I think of my mother, telling about the year she arrived in Minnesota, and the events leading to my birth in midwinter. 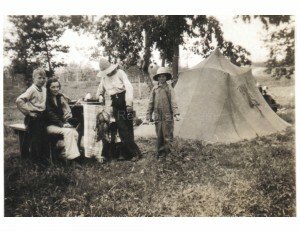 The Holland family camping in 1936 while they waited for a cabin to open at Rice’s Landing on Little Mantrap Lake. In the summer of 1936, my parents, Elmer and Betty Holland, decided to leave Chicago, Illinois to return to my father’s home state, Minnesota. A sales job with the Curtiss Candy Company (Baby Ruth and Butterfinger), had opened in the Park Rapids area. It was not an ideal time to move. The nation was inching its way out of the Great Depression and experiencing one of the most severe heat waves in modern history. Crops were burning and dust was rolling from the fields. Moorhead set a state record of 114° F.
My father had learned about 160 acres of woodland for sale near Park Rapids. It contained a house, some outbuildings, and a fenced pasture. The house “needed a little fixing,” but the price was right and it was located along U. S. Highway 71. So, with a telephone call and advice from a Park Rapids banker, my parents became owners of a farm, “sight unseen.” My father’s intentions were to raise sheep, while keeping his job with the candy company. My mother’s faith in her husband must have been strong as the family said goodbye and left Chicago in their 1928 Model “A” Ford sedan. The car was definitely overloaded: A luggage rack clamped on a running board held several leather suitcases; strapped on a rear bumper rack was a spare tire, a small cedar chest, and a large camping tent. Inside, in the front, were my father, his pregnant wife, and 9 month old Betty Suzanne. In the back, fifteen year old Raymond, thirteen year old Elmer Jr., and eleven year old Grace were squeezed in with a Wire Haired Terrier named “Pal,” and a glass bowl containing one disoriented goldfish. When the family turned off the hot U.S. Highway 71 and chugged up a hill into the yard of their new home, they immediately realized that the property was not quite what had been described. The farm house, which had been vacant, was in disrepair. There was no electric power, the telephone wasn’t connected, the roof leaked, and drinking water came from an old hand-dug well below the hill. My father decided to find another place to stay until repairs could be made. He found it a mile north at a small resort and store called “Rice’s Landing,” on Little Mantrap Lake. The family camped by the lake until a cabin opened. 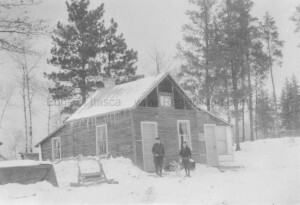 Raymond and Elmer Jr. at the original house during the frigid winter of 1936-1937. As house repairs were made, the hot summer breezes faded and cold weather arrived. My father learned that their cast iron stove was inefficient in below zero temperatures, and the wood he bought was of poor quality. A strong northwest wind pounded its way through small cracks and openings in the walls creating a new use for large cardboard advertising signs from the Curtiss Candy Company. The bad weather continued into January. Elmer Jr. and Grace, who were temporarily staying with their grandmother near Crookston, were unable to return home because of snow and cold temperatures. However, in late January there was a break in the weather and my father decided to make the 200 mile round trip to bring the children home. Raymond remained with my mother and baby sister. Mother was expecting my birth in late January. On the day of my father’s expected return, the temperature began to drop. Mother anxiously waited. The entire day came and went with no sign of her husband and two children. Questions raced through her mind: Did they have car trouble? Were they lost in a blizzard? Had they frozen to death? The next morning, to add to her worry, she began having premature signs of my approaching birth. Her immediate thoughts were to go to the hospital in Park Rapids. However, with no transportation or telephone available, she was trapped. With the temperature already below minus 30º F, she asked Raymond to load the stove with wood, dress warmly, and walk to the neighbors for help. Even in his warmest clothing, Raymond was not prepared for the frigid half-mile walk facing the bitter wind. He arrived at the neighbors shaking and numb, only to learn that their car wouldn’t start. After warming up, he retraced his route home, where he comforted Mother, then set out on his second half mile trek, this time south to the Pritchett Sawmill. There he learned “Swede” Pritchett had recently purchased a new logging truck (*). The truck started easily in the bitter cold, and Lawrence Weiss, a worker at the mill, agreed to drive Mother to Park Rapids. He first drove Raymond back to the house where my grateful Mother was helped into the truck and covered with blankets. Raymond stayed home, kept wood on the fire, and took care of my young sister. Park Rapids was a long fifteen miles away. Even with a state of the art heater in the truck, the cab’s windows were covered with frost when the truck slowed, then stopped at a large dormered building on North Main Avenue. It was the hospital, where I was born early the next morning. In checking the official weather records, it was evident that a six inch snowfall, with dropping temperatures, had kept my father from returning home. While the temperature was a mild 19° F at Crookston when he left home, it plummeted to minus 36° F. The weather station at Itasca Park registered a minus 41° F, while the unofficial outdoor house thermometer reached a low of minus 42° F. January of 1937 ties the record as the second coldest January in 114 years of record keeping at Park Rapids, with an average daily low of minus 18.8º F.
January is not a favorite month for most Minnesotans; most expectant mothers would probably not choose it as a time for giving birth. However, January is special because it introduces the new year. We can begin it with new resolutions and fresh ideas. January of 1937 was extra special to me because it introduced me to the world. While thermometers recorded a cold arrival, my mother welcomed me with a warm heart and open arms. A new baby boy! A new year! And I can’t help but think she was thankful a thousand times over, for Lawrence Weiss’s careful driving and “Swede” Pritchett’s new truck (*). (*) Correction 8/20/17: A subsequent conversation with Gene Weiss indicated the logging truck wasn’t his father’s (as stated in my original blog post), but was actually owned by “Swede” Pritchett. This entry was posted in All blog entries, EDGE OF ITASCA stories. Bookmark the permalink. Absolutely great story, Ren! You have such a way with words, and while I have heard about this birth before, it is so much better heard from your words! It is amazing how much talent there is in this family, and I wish there was a way to let everyone know about your blog. Do Ben and Peggy know how to access it? Right up Ben’s alley! Thanks, Randy, for sending this to us.